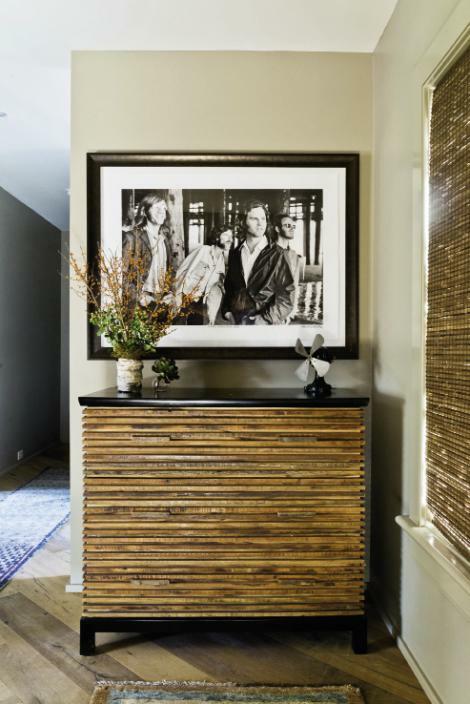 Rock the House: A black-and-white photo of The Doors by Henry Diltz hangs over a Brazilian wood chest by Environment in the foyer. 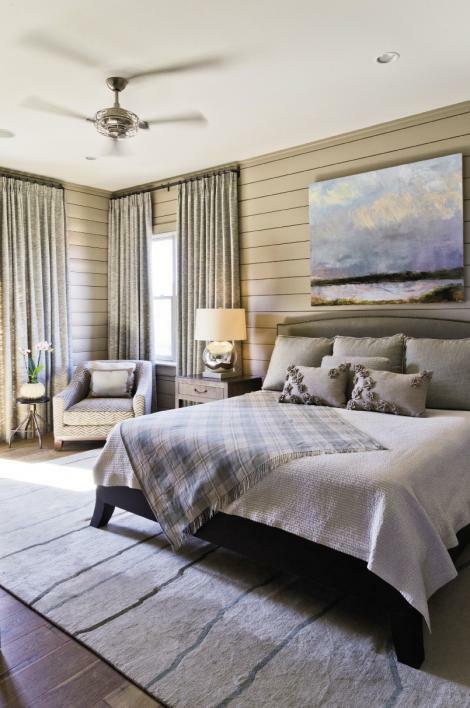 Mellow Out: Poplar wood paneling wraps a master bedroom (one of two in the house). The Tufenkian rug is from Tibet and the landscape painting is from Rebekah Jacob Gallery. 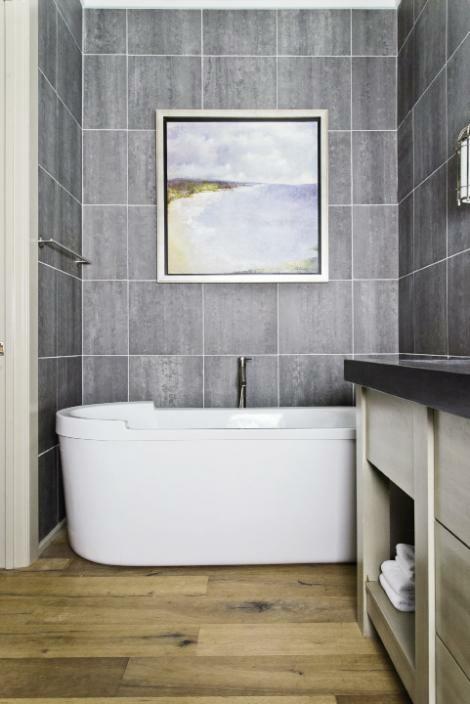 Spa Treatment: Gray slate tiles run floor to ceiling and offer a serene backdrop for deep spa tubs in both master baths. Neutral Territory: An antique Oushak rug is a natural backdrop for a pair of linen chairs from Baker Furniture. The wall flanked by bookcases is finished in Venetian plaster. 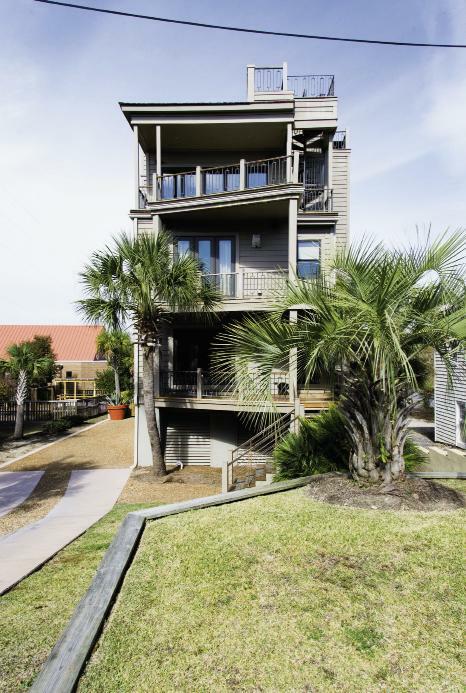 Box Set: Triangular decks offset the three-story home’s symmetrical stacked design. 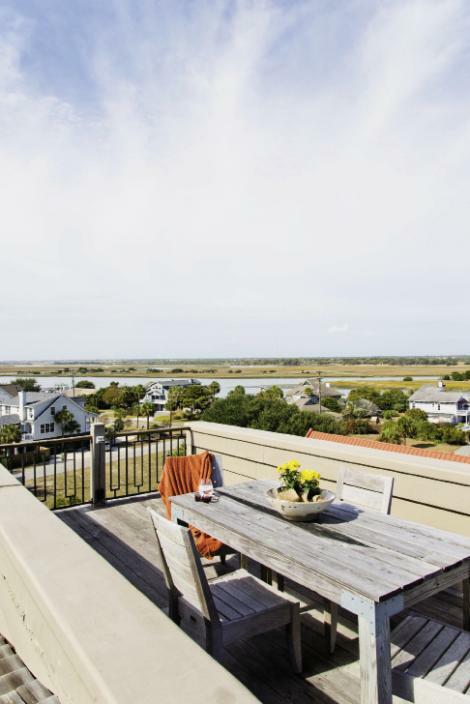 High Heaven: A rooftop dining area offers unfettered views of the Intracoastal Waterway. 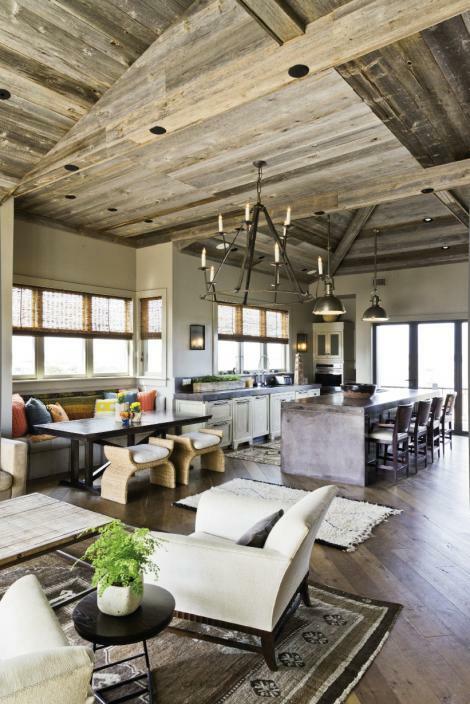 Up In The Air: A rustic, barnwood ceiling and antique Oushak and Moroccan rugs offset the kitchen’s cool, industrial sensibility, defined by a concrete island and countertops and Visual Comfort pendant lighting. Seat Yourself: A vibrant banquette cozies up the third-floor penthouse. The woven stools are by Baker Furniture, the table by Hickory Chair, the banquette seating by local artisan Matt Decell, and the Kantha quilt from Celadon. You have to give Brad Murr and interior designer Cortney Bishop credit for thinking inside the box. Straight up and down and neatly stacked, the three-story vacation home they designed on the Isle of Palms has a place for everything—a trio of beach-bright bunk rooms and a Moroccan-themed banquette, a penthouse living room and salty breezes drifting end to end, a high-flying rooftop deck and even a shot of rock ’n’ roll. Symmetrical, as it turns out, doesn’t have to mean straight-laced. “Brad wanted a house that was fun, that fit his family and a party or two as well,” says Cortney, adding that her clients’ workaday home is three hours away in Charlotte. “Escape was the idea. Think ‘boutique hotel,’” she says. And as with any good story, there’s a hook—in this case, a hint just behind the earthy, lap-siding facade that kicking back, even whooping it up, is welcome. “Right inside the entrance, we hung a large black-and-white photo of The Doors over a contemporary, Brazilian wood chest,” says Cortney—a nod, she says, to Brad’s affinity for live music, not to mention the family’s easygoing vibe. And there’s another clue, this one underfoot: On the first and third floors, Cortney set the white-oak flooring on a diagonal. It’s a subtle, off-kilter echo of the rock ’n’ roll welcome and bunk rooms on the ground floor, and the eat-drink-and-be-merry mood further up (more on that in a moment...). “Rather than one being an extension of the last, I wanted to really differentiate among the floors,” says Cortney. And it explains why, on the second floor, things really mellow out. Those planks go straight and symmetrical, setting a quiet, orderly stage for a pair of master suites. Mossy green linen draperies, custom Tufenkian rugs from Tibet, and walls wrapped in wide plank poplar wood bridge modern and serene. In the adjoining baths, large slate tiles rise floor to ceiling, and chrome fixtures pair with bright white porcelain (most notably in the form of deep spa tubs). 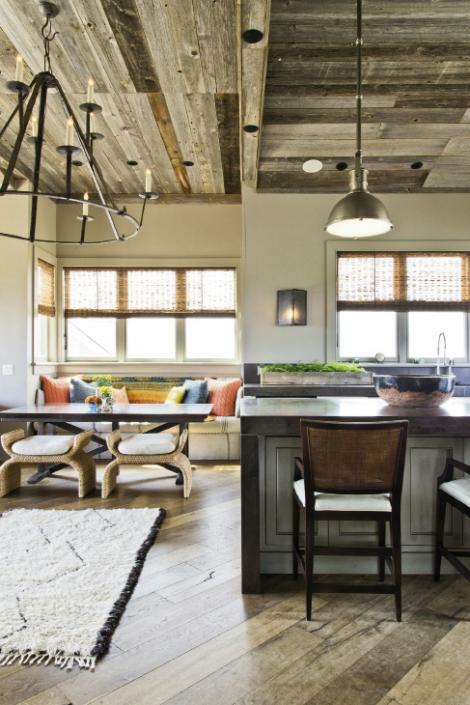 Ocean breezes float right through a simple open kitchen with a concrete island and metal pendant lighting; a living area with cozy, cream-colored seating; and a vibrant banquette in between, built by local artisan Matt Decell. “We chose neutral base fabric and wood finishes in this nook so we can switch those layers out,” says Cortney. At either end, glass Nano Doors—a window system designed so walls “disappear,” similar to garage or barn doors—fold up accordian-style. “Up here, you have views of the trees, the skies, and the water,” she adds. 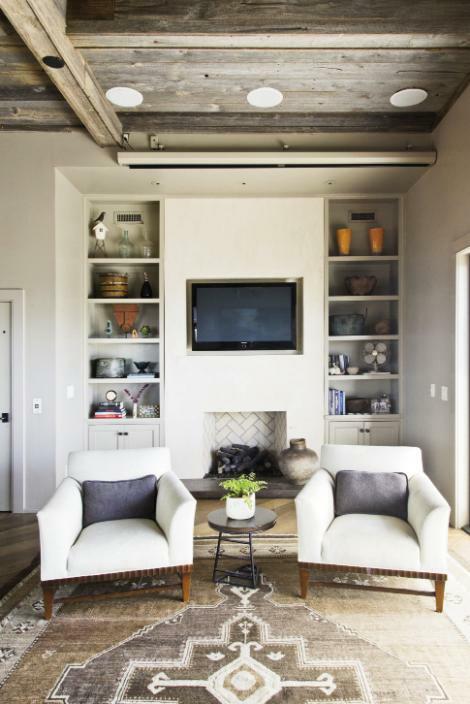 “These are all elements we want to play up.” To that end, a grayed barnwood ceiling highlights the natural landscape, as do the jutes and sandy blues of the room’s palette. And funky details—like the ceiling planks placed at directional odds with the floor, a ladder-access TV loft for the kids above the kitchen, and lively Moroccan-hued pillows on the banquette—keep the mood as easygoing as the island outside. “We liked the laid-back culture here, and our priority was to carry that through in our house,” says Brad. golden retriever, Reese, and St. Bernard, Cocoa, at whim. Back inside, the same crew bounds up and down the stairs, stretches out, and basks in their little corner of the island.